Eye makeup can enhance your features easily. With the right eye makeup, you can accentuate your protruding eyes in a natural way. Even if you do not have big protruding eyes, there are makeup hacks that help you have them. How to know whether you have protruding eyes? With a curved line or a fold as a crease instead of a deep angled crease. Your lower lids form a bottom shadow. If your eyes are bulging, the crease will be a line or a fold. The crease will be deep if your eyes are inside the socket. Makeup of the protruding eyes can be tricky. But there are many eye makeup looks that can make your eyes look natural and beautiful. 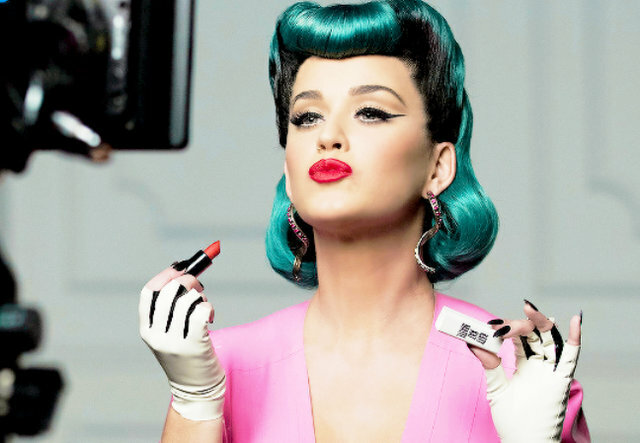 If you are looking for a casual eye makeup that is not so loud, then you can try the simple look created by Katy Perry. To start with, apply a concealer on your eyes. You can use MAC’s faithful Pro Longwear Concealer. After applying the concealer, line the inner corners of your eyes to the outside with liquid eyeliner. Next you have to dust a pale peachy pink eye shadow and highlight your bottom eyelashes and inner corners of your eyes. Katy picked Urban Decay Naked 3 Palette for this purpose. Now you have to apply a thick colour shadow along the crease of your eye, which is black in colour. Make sure to use it properly. Do not go overboard with it. If you have brown eyes, you can pick brown or any other shade that is dark. This goes well with protruding eyes and also brings more intensity to your eyes. Blend the colour in the middle of the eye. This will give more shape to your protruding eyes. Finish your eye makeup with black volumizing mascara. This will give a dramatic look to your lashes and enhance the beauty of your eyes. Mascara helps in making your eyes look prominent and beautiful. It is particularly needed for women who have smaller eyes. As for your face, you can skip foundation and just apply some concealer and loose powder. For the office you need light eye makeup with bright lip colour and eyeliner. This will enhance your eyes and makes your eyes look bigger. You can try Kim Kardashian’s makeup. Her slightly contoured cheeks and defined eyes, along with flawless skin and pink, glossy lip, is a perfect office look. Kim Kardashian has large, deep set eyes. If you have such eyes, begin your eye makeup with Bobbi Brown’s Tinted Eye Brightener. Apply this to cover the dark circles. Once done, pick waterproof black kohl eyeliner and line your top and bottom lash lines. You can use Extra Intense Liquid Pencil Eyeliner in Black for lining your eyes. Do not go overboard with the liner. Line your eyes from the inner corner to the outer corner. This will highlight your eyes and make them look brighter. To get super dramatic eyes, use Mascara Voluminous Butterfly. Go contour for your face. Apply a little of La Couleur Infallible Bronze Divine to the hollows of your cheeks and your forehead. Blend it well. Use a brush and apply a light rosy blush on your cheekbones. This will give a hint of colour to your cheeks. You can use True Match Barely Blushing W3-5. For your lips, you can apply a bright coloured lip gloss. If needed, you may use a conealer or face powder. Without it is also you will look great. Have you seen Nicole Richie on the red carpet? She looks gorgeous and never fails to make a statement on the red carpet. She looked stunning at The Art of Elysium Gala, complementing her ensemble with a pair of Christian Louboutin shoes, her own jewelley, and a vintage clutch. She highlighted her looks with her dramatic eye makeup. Black and grey are now the classic high glamour team for any red carpet event. Nicole does full justice to it. She used rich and warm tones. She applied a shimmery grey eyeshadow on her eyelids and the inner crease line. For this she used Sephora IT Palette Smokey. On the outer crease line, she used NYX Eyeshadow Base, black in colour. Once the eyeshadow is applied, you have to line your lash lines. Use Maybelline New York Line Stiletto Ultimate Precision Liquid Eyeliner for this purpose. Finish your eye makeup with the application of two coats of mascara to boost your lashes. For this you can use Clinique Lash Power Feathering Mascara. You may also use an artificial eye lashes if you wish so. Use concealer to hide the dark circles under your eyes. This can reduce the protruding effect of the eyes. Reduce the prominent eyeball look by applying a medium to dark eyeshadow. Apply a light-coloured shadow on the brow bone. Take care not to apply it in the inner corner. An ivory shadow is a good choice. The eyeliner is usually applied along the shape of your eyes. But when you have protruding eyes, make the line extend beyond the outer corner and on the eyelid itself. For the inner corner, don’t line the natural line. Instead go just a little higher. But make it look natural gong gently. This way, the line looks straight instead of looking round. Apply kohl on the inside of the upper lid, close to your lashes. Don’t let the line go to the inner or outer corner. This line helps in emphasising the base of your lashes. Apply the kohl on the line lower lid as well. This line also should not go to the corners of the eye. Apply mascara only on the upper lashes. Make the outer ashes look longer. With the right makeup, you can make your protruding eyes look natural and beautiful.